Shares of JPMorgan (JPM - Get Report) jumped on Friday, closing higher by 4.63% to $111.21 after beating on earnings and revenue expectations. A positive reaction for PNC Financial (PNC - Get Report) is helping, as the duo gives the bank stocks a lift. While Wells Fargo (WFC - Get Report) beat on earnings and revenue expectations, shares are down about 3% in midday Friday trading. JPMorgan and Goldman Sachs are holdings in Jim Cramer's Action Alerts PLUS member club. The team said: As we look forward, management pointed out that equity underwriting fees should bounce back in the second quarter due the large number of U.S. IPOs. Remember, one way to play the slew of big IPOs this year are the big banks like JPMorgan and Goldman Sachs. Want to be alerted before Jim Cramer buys or sells JPM or GS? Learn more now. 18-month daily chart of JPMorgan stock. Shares of JPMorgan, Goldman Sachs (GS - Get Report) , Bank of America (BAC - Get Report) and others were breaking out in mid-March, but cratered off that breakout on worries over an inverting yield curve. Those worries were short lived and we got a rebound in these stocks as a result. 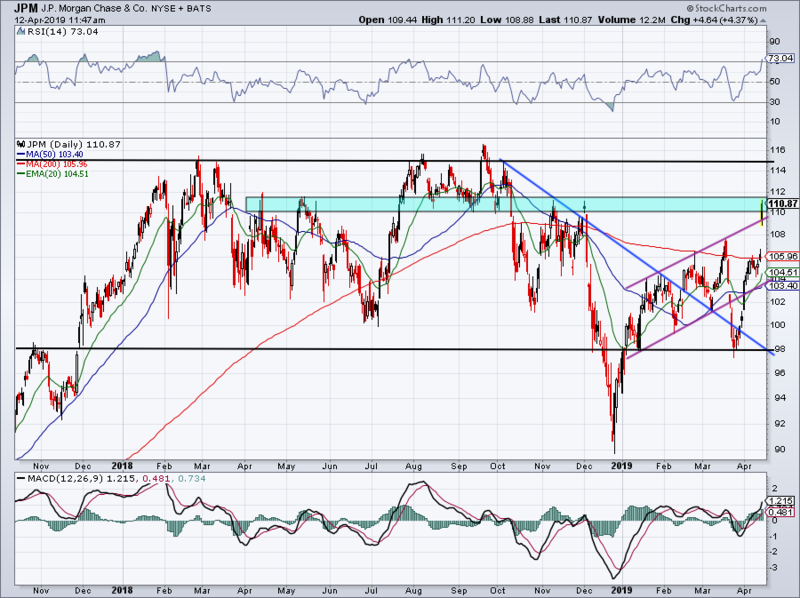 For JPMorgan, it brought the stock back to recent range resistance near $106 just before earnings.